Still stuck on choosing a topic for your next health blog post? Have you now chosen a topic for your next health blog post? Signing off and toasting: To strategically prioritizing topics for you next blog posts. Don’t want to DIY this strategic plan? Originally published Feb 2018. Updated with even more awesomeness Mar 2019. As entrepreneurs, we can find ourselves somewhere between each extreme when it comes to choosing a topic for our next blog post. 1) We have NO IDEA what topics to blog about. Blank slate. Writer’s block. 2) We have NO IDEA which one of our gazillion ideas we should choose first. 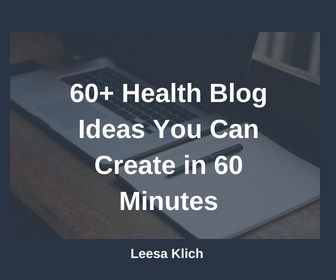 If you’re in the first camp and need topic ideas for your health and wellness blog, then let me give you dozens here: 60 health and wellness blog ideas. But once you have a few (or a gazillion) ideas, how do you choose which one to create first? 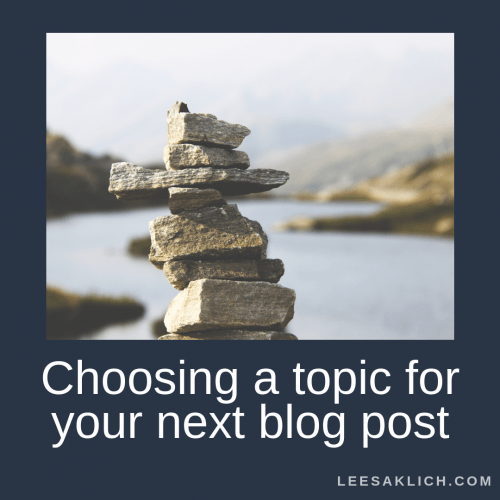 Let me share with you my strategy for choosing a topic for your next blog post. BTW, I use this strategy to plan out 12 weeks of posts at a time, so go ahead and grab a free editorial calendar, add in your 12 next publication dates, and fill them in based on these priorities. The first thing to think about is: what are you currently promoting? Are you trying to grow your email subscriber list with a certain opt-in? Do you have a product, program, or service that you’re currently booking? Are you running a contest or survey right now? If so, that’s what your next blog post topic should be about. NOTE: You don’t need to turn your blog post into a sales page, just provide some great content that will help your readers with the problem your current promotion solves. Don’t forget to include a link to your sales page. Share a case study or client success story related to your current promotion. Talk about the benefits of your current offer–how does it help your clients and customers? What do potential clients need to know about how to best work with you? Talk about that. What kinds of things need to be in place before people see success with your current promotion? Do they need to have a few fridge/pantry/kitchen essentials? Do they need a piece of exercise equipment? Is there a mindset or level of commitment they need first? Here’s an example where I talk about the things that need to be in place before creating a content strategy. You can create a post like that. If something is going down in the media and social media in your niche–weigh in with your two cents while the topic is HOT. If you’re seeing a lot of online chatter in your area of expertise, your audience probably wants to hear your thoughts. Be sure to give it to them like I did here with #BellLetsTalk or when Health Canada released the latest and greatest food guide yet. If you want to do a bit of research before jumping into the conversation, check out these recommended credible sources for health research. Is there a special date coming up that speaks to you, your niche, and/or your ideal clients? If so, then choose a blog post topic to correspond with that date. Is your birthday or biz anniversary coming up soon? Talk about that (and even hint to a special gift if you’re doing something like that). What should your audience do to prepare for the upcoming holiday? If you’re launching something or going all in to promote it in the next few weeks, it’s probably time to start creating content around that. Make sure to have a call-to-action somewhere in your blog post so readers can stay tuned to see what you’re launching soon. It can be an email opt-in or link to follow you on social media for updates. Share a case study or client success story related to your upcoming promotion. Talk about the benefits of your upcoming offer – how does it help your clients and customers? What kinds of things need to be in place before people see success with your upcoming promotion? If you’ve done a strategic keyword report in your niche, and have a list of keywords you want to target, start creating blog posts on each one. Take the best keyword from your list (highest monthly searches and lowest competition) and create an epic post for it. Remember to optimize your post by including your keyword a few times to be sure that search engines like Google know exactly what your post is about (i.e. what keyword you’re targeting). Be helpful. Be educational. Give value. While this is priority #6 for your very next post, it should actually be woven into most of your blog posts. Some would give it the 80/20 rule where you’re giving value 80% of the time, and promoting just 20% of the time. Do your audience and clients ask you a few key questions? Answer those. Do they want tips or a tutorial on how to do something? Create that. What advice would serve them most – Your routine? Grocery list? Recipes? Share those. What does your audience need to know about – How to upgrade their habits? Why they should start (or stop) with a certain food/drink? The little known (but proven) benefits of a certain diet, supplement, or exercise? Personally, I would (almost) always prioritize strategy over inspiration, but I definitely make exceptions. EXAMPLE: Last year I got freaking pissed and HAD to interrupt my “regularly scheduled programming” to respond to being inundated with emails. These emails were from random strangers on the internet asking me for a backlink or feedback on their post. And, I started seeing fellow wellness professionals also asking whether these emails were legit because they weren’t sure what to do. I was inspired to create a video response to this poor quality outreach. Is there something you just have to get off your chest? Write it up (or record it). Are you doing some cool “behind the scenes” stuff? Share it. Have you won an award or will you be featured on another blog, vlog or podcast? Talk about that. Did you come across an awesome article or recipe (or two) this week? Share those. Want to share something more personal–about your education, a recent insight, or even a guilty pleasure? Go for it. Do you have a blog post that’s over 12-months old and needs updating? Why not do that? I’ve created a few things that can help you. Here’s that Health Blog Editorial Calendar you can download for free–no email required! Second, here is the very comprehensive list of health and wellness blog topic ideas I mentioned earlier. Third, here is the link to that Health- and Food-Awareness Dates Calendar with over 400 entries. Fourth, you can purchase a niche-specific, researched, pre-written “done for you” health article for your blog, and customize it for your brand, voice, and audience. If not, then maybe it’s time to create a plan so you don’t need to scramble on choosing topics for your next few months of blog posts! First, create a content strategy mission statement. Second, fill out your health blog editorial calendar using these seven priorities. I generally don’t go more than 12-weeks out as stuff can change. Third, have fun creating your newest blog post (and feel free to link it in the comments below, telling us which strategy/priority you used to choose it!). Your blog is the main way to build your “know, like, and trust” factor with your audience. By strategically prioritizing topics and calls-to-action your blog will build your business. What do you think? Do you have exactly zero blog topic ideas or a gazillion? How do you choose which to post next? Do you have any strategic ideas to add? Let me help you plan out your next 12 blog posts. And as a BONUS, I’ll give you a bunch of niche-specific, researched, pre-written “done for you” blog posts, so you don’t even have to create them all from scratch! Let’s strategically plan your content strategy and editorial calendar in advance, so you know what you’re going to post about Every. Single. Time! This is super helpful right now! I sometimes get stumped by the number of post ideas I have, because I can’t just choose one!